The Purana starts by talking about the end of the war between the Pandavas and the Kauravas from the Mahabharata. This is how I stumbled upon my first favourite story, which is how Parikshit was called Parikshit, and how he was born. The second story that I enjoyed came up a little later. The part of the Purana that really surprised me was right at the start of the book that talked about Parikshit. They say that Parikshit was not at all scared when he heard the sage’s son curse him. He instead decided to do prayashchitta on the banks of the river Ganga, and asked Shukadev, Vedavyasa’s son to tell him all the good things a dying man would want to hear. This has never been mentioned in the books I have read about Parikshit, so I enjoyed this part. Let me move on to my favourite stories. Ashvatthama’s Punishment: Towards the end of the war between the Pandavas and the Kauravas, we know that Bhima and Duryodhana had a duel with their maces, and that Bhima crushed Duryodhana’s thighs with his mace. This left Duryodhana defeated but not dead. Ashvatthama was not pleased and decided to show his loyalty to Duryodhana. He killed all of Draupadi’s sons in the dead of night and presented the heads to Duryodhana as a gift. Draupadi was now thirsting for revenge, and Arjuna promised to get her Ashvatthama’s head. Arjuna found Ashvatthama and challenged him to a duel. Ashvatthama let loose a brahmashira weapon, and in return Arjuna let loose his own brahmashira weapon. If both the weapon’s clashed, it threatened to burn up the entire world. Arjuna withdrew his weapon, but Ashvatthama didn’t know how to release the weapon but not withdraw it. The weapon was then directed to Uttara’s womb. Uttara was Abhimanyu’s wife, who had perished in the battle. Uttara prayed that Krishna save her unborn son. Krishna entered Uttara’s womb to protect the baby, who was none other than Parikshit. As the baby had been protected by Vishnu, the sages proposed he be named Vishnurata. When Krishna had entered Uttara’s womb, Parikshit had become devoted to Krishna. So, whenever he met anyone, he tested if that person was the one he had met in his mother’s womb. As the word for test is pariksha, he was known as Parikshit. Arjuna captured Ashvatthama and the Pandavas decided not to kill him as he was the son of their guru, Dronacharya. Ashvatthama used to wear a jewel on his head. They cut the jewel off and gave it to Draupadi and let Ashvatthama go. Rukmi’s Death: Rukmi was Rukmini’s brother. Rukmini was abducted and married Krishna. Ashamed that he could not fulfill his promise to kill Krishna, he began to live in the city of Bhojakata. Rukmi’s daughter was Rukmavati, who was married to Pradyumna, and his grand-daughter was Rochana was married to Anirudha, Rukmavati and Pradyumna’s son. Balarama, Krishna and other Yadavas came to attend Rochana and Anirudha’s marriage. Balarama was fond of playing dice, so he started playing with Rukmi. Balarama first placed a hundred coins as a bet, but he lost. Deciding not to give up, he staked a thousand gold coins. He lost all that too to Rukmi. Not content, he placed a bet of ten thousand gold coins. Unfortunately, he lost this to Rukmi too. Finally, Balarama staked a lakh of gold coins. This time he won, but Rukmi was not ready to admit that Balarama had won. Balarama got so angry that he killed Rukmi with a club. 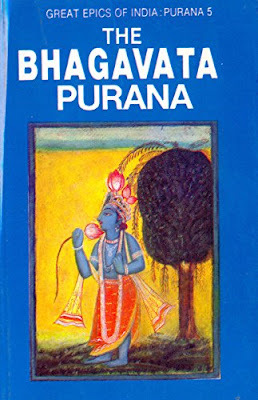 This Purana talks a lot about of the exploits of Lord Krishna, and some of the stories in this Purana varied from the versions of the same story that I have heard about. This Purana is the most sacred of the Puranas. Anyone who is devoted to Lord Vishnu will love this Purana. It is a text that should be studied, heard and thought about with a lot of care. In the month of Bhadra it should be placed on a golden throne and donated. Anyone who does this is sure to acquire everlasting punya. This review was first published in IndicToday on April 3, 2018.